This take on nachos is inspired by the flavours of India and turns a super-unhealthy treat into a nutritious dinner. Protein-rich, spiced chickpeas are layered with fresh, raw vegetables and herbs, all held together with a little melted cheddar. Although not Indian in any way, the deep savoury flavour of cheddar goes surprisingly well with Indian food! The red onions are quick-pickled in fresh lemon juice, resulting in gorgeously coloured, super-easy and speedy pickled onions. So you can have lovely pickled onions ready whenever you need them. 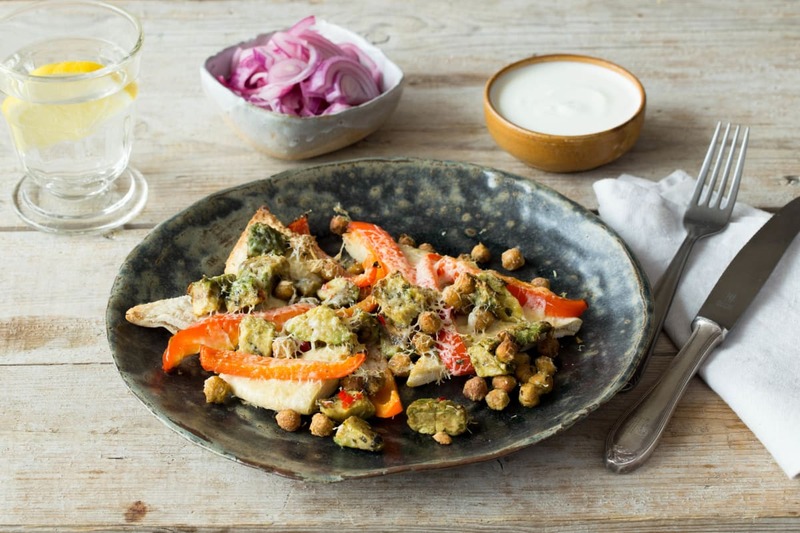 Any leftovers can be tossed together and served the next day as Indian ‘panzanella’. Pre-heat the oven to 200 degrees. Drain and rinse your chickpeas in a sieve and dry them using kitchen towel or a clean tea towel. Toss them in 1 tbsp oil, the cornflour, garam masala, cumin, ½ tsp salt and a few good grinds of black pepper. Pour them onto a baking tray in as even a layer as possible Bake for 30 mins until lightly browned, tossing/stirring once or twice. When they are cooked, leave the oven on. While the chickpeas are roasting, peel and cut your red onion in half through the root and thinly slice it into half moons shapes. 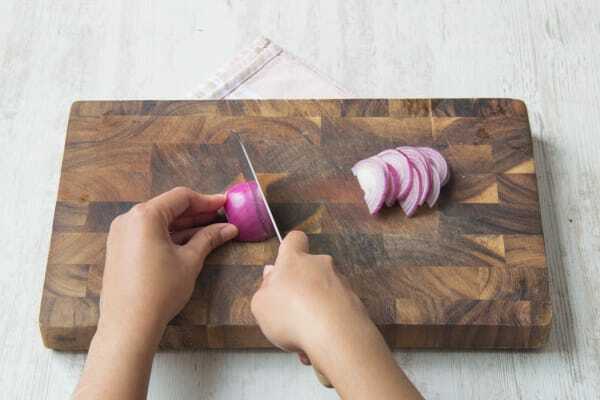 Put your onion slices in a bowl and squeeze over the juice of half your lemon. Season with ¼ tsp of salt and stir to combine. Set aside to pickle. 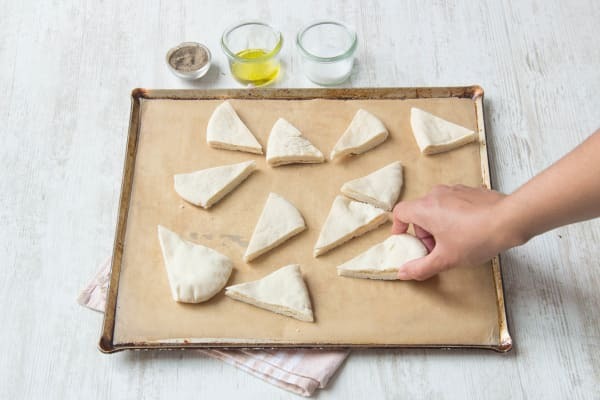 Cut each flatbread into eighths and arrange on a baking tray. Brush with a little oil and sprinkle with salt and pepper. Bake for 10 mins, until lightly browned. Tip: Leave them to cool for a bit after this to become nice and crispy! Remove the core from the red pepper and slice into 1cm strips, set aside. 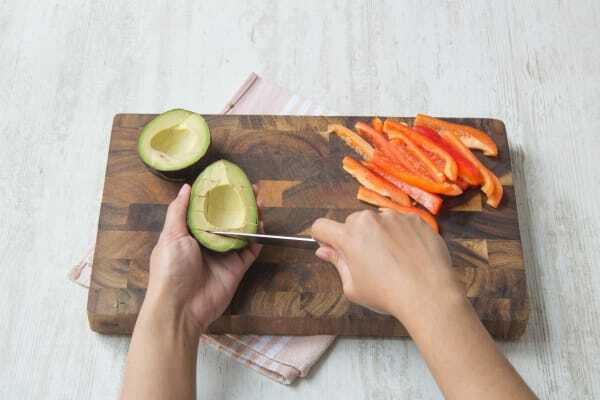 Cut the avocado in half, remove the stone, chop into chunks and mix it with your pepper. Now it’s time to make the dip – finely chop the garlic and stir into the yoghurt with ¼ tsp of salt and the other half of the lemon juice. Chop the red chilli in half, remove the seeds and chop it finely. Tip: Wash your hands afterwards! Pick the leaves off the mint and roughly chop and mix together with the chilli. Grate your cheddar. Once the chickpeas are done, remove them from the oven and mix in a bowl with the avocado and red pepper. Add the chilli (as much as you dare!) and mint mix to the bowl and stir. Turn your grill to high. 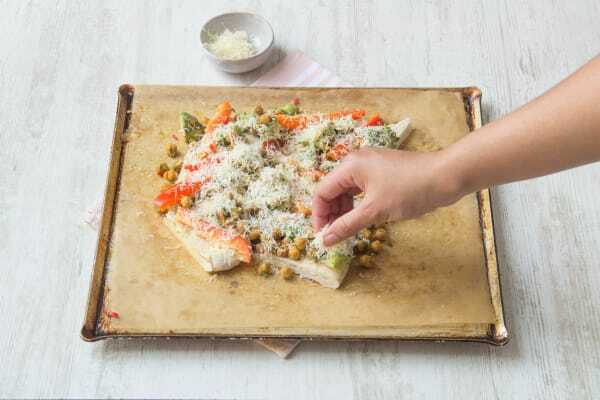 Layer the chickpea and avocado mixture over the flatbread triangles and sprinkle over all the grated cheddar. Put under the grill for 2-3 mins, or until the cheese has melted. Serve with a good spoonful of your lemon-pickled red onion and your yoghurt-garlic dip.